This delicious lemon curd coffeecake recipe never disappoints. This delicious coffeecake is a huge hit in our breakfast room. By popular request, Pastry Chef Phyllis is sharing the recipe. 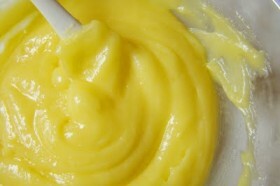 As a time saver, she suggests using a high quality purchased lemon curd. However, if you wish, to make your own – try her outstanding homemade lemon curd recipe. By the way… the coffeecake and streusel topping recipes are real keepers! Using this as your basic coffee cake recipe, the flavor options are endless. Blend these ingredients and set aside. Add eggs, vanilla, and sour cream to the butter and sugar mixture. Add flour, baking powder, and baking soda and continue to mix. Sprinkle the streusel mixture over the top. Bake at 325ºF until a toothpick inserted into the middle comes out clean. BONUS: Visit our Recipe Files for more great Rabbit Hill Inn recipes. Check back frequently, as we continue to add more recipes from the Rabbit Hill Inn kitchen. From time to time, you’ll even see a cooking video. SO be sure to bookmark this page. This entry was posted in All things Culinary, General, Recipes by leslie. Bookmark the permalink.